Did you know that millet is a complete food? What distinguishes millet from other foods in the diet is the representation of highly valuable proteins, carbohydrates, vegetable oil, plenty of minerals and vitamins. In the millet there are all important essential amino acids, lecithin, and a large amount of quartz acid. Herbalist Master Rivius in 1560 wrote in his writings: Millet has great benefit to all the people who are suffering from dropsy because urges to urinate and increased sweating. Saint Ambrose used millet to leaflet stomach pains, fever and weakness of the various bodies. Later, with the development of humanity and with the possibility of application of laboratory research, had led to the fact that millet is extremely healing herbal remedy, especially when it comes to gout, rheumatism and for cleansing blood and lymph. 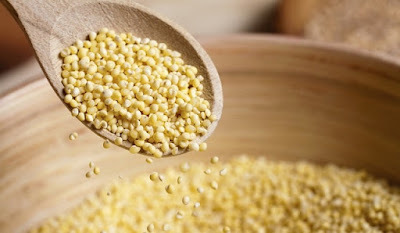 Millet is a food rich in vegetable proteins of high biological value. Amino acids that are important for a man, and must be consumed with food, are mostly present in the millet. Plenty of cellulose, carbohydrates, crude oil makes millet as high worth food for athletes, people who are engaged in physical activities and through recovering from illness. Minerals present in the millet are: calcium, iron, magnesium, sodium, fluorine, copper and phosphorus. Vitamins, which were found in the millet - vitamin A, C, E and B group vitamins. Matter which makes millet very characteristic is marked as quartz acid. Why the quartz acid in the millet is so important? Because the quartz acid is present in a soluble form, and it is in an ideal relationship with other nutrients in the millet. Quartz acid is important for healthy skin, for strong teeth and bones, for a strong and shiny hair, as well as for better circulation. Lack of this acid leads to hair loss, brittle hair and nails, the appearance of white hair and the like. Millet porridge is an extremely easily digestible food, and in the body creates an alkaline environment. It is ideal for use in stomach problems, due to excessive ingestion of antibiotics, in excessive ingestion of acidic foods (meat), in disorders of the intestinal micro flora. Millet porridge is healing for bowel and intestinal bacteria, because it provides an ideal environment for bacteria, and thus prevents fast growing of bacteria and prevents disruption in digestion. Millet porridge shouldn’t only use by persons with disabilities in digestion. On the contrary, millet should be an integral part of the diet of each individual, for 2-3 times a week. Experimentally, it was found that taking a teaspoon of millet every day before breakfast, has beneficial effect on the appearance of the skin, hair and nails. Take a cup of millet and soak with five times the quantity of cold water for five hours. During this period, millet should swell. Put swell millet on the heat to warm up and add more water if necessary. If you have so little water during staying millet in water, it shouldn’t be thrown, because it is also nutritious. In the Millet porridge can be added finely chopped vegetables (carrot, celery, onion, parsley). At the end of cooking, add a little salt. Millet flour is used for making vegetarian bread, rolls, and pancakes. It can be mixed with wheat flour and rye flour to give full healing effect. In this combination of flour, millet flour is represented with 15%.